Can You Take Me Back…? this Ron Howard-directed rehash of the thrills and chills of Beatlemania is pretty much all that you would expect and then some! In a way, this film wasn’t really that much better than the Elvis documentary that I reviewed last month, because it’s all so familiar. Eight Days a Week earns an extra star because it isn’t 4 hours long, Howard doesn’t use the Ken Burns interview technique and there is some new footage, like clips of the band in Manchester in late 1963 (below). Supposedly, this was the first color movie with sound of the band performing and it’s pretty cool by anybody’s standards. But about that new footage: It actually translates to the Beatles running offstage for the last time. Big whoop, ya know? Except for the above footage from Manchester and a few other snippets here and there, the “new footage” does not equal “performance you’ve never seen”. Even the the performances of She Loves You and Twist and Shout from Manchester are not really that earth-shattering because the Beatles were well-rehearsed and very consistent performers. If you’ve seen footage of them playing these songs before… The footage from their first US gig in Washington DC is great quality, but that performance has been on YouTube for years, albeit at much lower quality. The PROS: The one aspect of this film I really liked was shots and interviews of regular people: A huge crowd of male Liverpool soccer fans singing She Loves You! Killer! A hilarious group of New York girls talking about which Beatle they loved! Awesome! Sigourney Weaver talking about seeing the Beatles at the Hollywood Bowl! Hotness! Whoopi Goldberg, who saw the Beatles at Shea Stadium! Whoopi! Elvis Costello in a cool hat talking about Revolver! Elvis! Dr. Kitty Oliver, who saw the Beatles in Jacksonville when they refused to play to segregated audiences, and it was the first time she had ever been in a mixed race crowd of people! Beautiful! Finally, newsguy Larry Kane, who was a major presence in the Philadelphia market for over 30 years. A pedantic, uncool, almost Howard Cosell-type guy who, through his traveling with the band, became good friends with the Beatles, especially John Lennon. His reports are so unhip, they are completely hysterical! He was always like that…but he was a good news reporter. The CONS: Not one shot of George Harrison playing a guitar solo, although there is a brief minute of him singing Roll Over Beethoven in a snarly tone I’ve never heard before. Too much Starr/McCartney reminiscing that’s been done before. Instead of a few more restored or colorized clips of the Beatles playing in Washington in 1964 or at Budokan, Japan in 1966 we are treated to endless still photo montages of the Beatles traveling, running from girls, having pillow fights in their hotel rooms, running from the stage, doing photo shoots, doing press conferences, and smoking. They did a lot of smoking and for some reason this film needed to animate the smoke from still photo cigarettes. Then there are the shots of helicopters in Vietnam, rednecks burning Beatle records because Lennon said something about Jesus, people rioting, Oswald’s rifle, Kennedy’s motorcade…Yea, I know context. The problem is the context always seems to overwhelm the music and before you know it, you’re watching another very familiar-looking special on the 1960s. If you know that story or have seen it before, you won’t find much in this movie to celebrate. If you have no idea who the Beatles were, don’t understand what the 60s were about, or are a fan that needs to see everything, you’ll probably enjoy this. I watched this with my girlfriend and she didn’t like it either but we both enjoy watching the old concert footage. We’re going to try to find a collection of the old concerts if something like that has ever been made?? My birthday is in a few months. When Tom Petty and the Hearbreakers first burst on the scene in the mid-70s, I was…ah… suspicious — it seemed to me, inexperienced music fan that I was at the time, there was a possibility the band was aiming for pop stardom or LA pretty boy fame that could be leveraged into… I dunno…a career as game show hosts? Stars of the next Cameron Crowe movie? Well, it quickly became apparent that my radar had been faulty as Damn the Torpedoes, their big breakout album, proved to be a smart, rockin’ affair, chock-full of great tunes and great playing. Even at this point in his career there was an edge to Petty that, although he was laconic and laid back about it, basically announced to the world and any and all potential business associates, that he was always gonna do it his way. Call me crazy, but I can’t help but admire a person with those kinds of instincts and sensibilities. Though he never sounded or acted much like a Southern Rocker, for all intents and purposes Petty was; one just had to peel back the layers a bit to see it. And then, there was The Heartbreakers, his backing band. And what a band! Guitarist Mike Campbell quickly established himself as a “tastemaster”; a well-grounded player versed in all of the essential elements of great rock and roll styles, but disciplined enough to always support the singer and the song. Likewise for the keyboards of Benmont Tench. Neither guy ever overplayed his hand. The great rhythm section of Stan Lynch/Ron Blair gave Petty the ability to write songs as tight as The Beatles/Byrds or as loose and funky as Stax/Booker T and the MGs, which is exactly what he did and they always pulled it off awesomely. As the 70s rolled on into the 80s, Petty’s star kept rising and though some of the albums were not fully realized and some of the critics chided him for being shallow or not fully committed to I don’t know what, there was always that Tom Petty song on the radio that I didn’t change the dial on…and so the moorings of a 40+ year career were established. By the mid 80s he was headlining a whole new genre — HEARTLAND ROCK; a “movement” that only lasted about 10 minutes in 1985, but is still a thing in programming jargon. How Petty and his band went from LA New Wave to heroes in Iowa in the space of 10 years is still a mystery. Perhaps LIVE AID had something to do with it. Or FARM AID. I dunno…the 80s were a little confusing. I was certainly confused sometimes…Talk about connecting with your (or somebody else’s) roots! U2 was probably more than a little jealous. After all they TRIED to do the same thing with Rattle and Hum and all they got was well-deserved derision. (Maybe it’s just me, but the guy who wears the sock hat constantly never sounded particularly “rootsy”). The truth is TP and the Heartbreakers kept building their nationwide audience by subterfuge; they had played Heartland-sounding music from the beginning, wrote great songs, and avoided all of the bombast and most of the overexposure that plagued other 80s stars (Phil Collins, Sting, Huey Lewis). Sure, Stevie Nicks sang with the band on a big hit song, but not liking Stevie Nicks is downright UnAmerican. The band was able to score hit song after hit song because that is the medium to which Petty excelled as a writer and probably how he related to rock and roll in the first place. So, as a band they were always around, no matter the “era”. The Future’s So Bright I Gotta Wear Shades! Then there was what I like to call the LIKE-ABILITY FACTOR. A lot of rock stars aren’t really very likeable, some are even complete a-holes. Yet, one always got the sense that Tom Petty was a pretty cool, down-to-earth, affable guy, even if he was ornery sometimes. You understood the orneriness and accepted it though because he was in a tough business and no matter who you are, everybody’s had to fight to be free. He didn’t take himself too, too seriously and was always honest about his feelings and intentions and that counted for a lot. You never felt like he was putting you on or telling you stories about people he read about in the newspaper. I hate that crap. With Tom it was always personal, but never overblown. He knew how to write and sing to people so they didn’t feel put upon. Did you know that the song I Won’t Back Down was inspired by an arsonist burning down Tom’s house? While he and his family were in it? Most of the house did burn down and the person was never caught and that’s pretty messed up, yet a very succinct and brilliant song came out of the ordeal. A song you could sing after 9/11 or in the cancer ward…or after someone tries to burn down your beautiful house. There was always that to-the-point authenticity to Petty’s single-based songcraft and the fact that he didn’t give you a 9 minute story like Dylan, turn it into a hopeless dirge like Springsteen or pile 34 different instruments onto the track like Mellencamp made you like him even more. He wasn’t ever gonna be nominated for a Pulitzer Prize, but, thousands and thousands of people were capable of singing along because they KNEW his songs. That’s a pretty impressive achievement, especially in today’s 8 second attention span world. …into one of his chart-topping songs? Petty’s inherent goofiness and rock and roll sincerity made everybody sit up and RESPECT because he had that real deal gift for the art of communication. Even the songs that don’t sound like much will fool you. Listen again and you will find they usually contain a line or couplet that just defines life or a person’s place therein, and you’ll realize (after your 50th listen) that maybe it’s this small comment on emotions, the unfair nature of life, or unbridled human determination to go on that was the basis for the whole song in the first place. Tom did that a whole lot because these moments are scattered throughout his catalog. He would continue writing and recording songs for another two decades with the same sense of assurance and modeled on the same sounds and influences that always worked. In time, the band became an institution and I do believe that Tom knew that his time was coming to an end, at least as a rock star, so he loaded up the tour wagon one more time and went out like a boss, doing what he loved, taking it to the people like he and the Heartbreakers had been doing since the 1970s. And so… I was shopping for Christmas dinner a few months after Tom Petty passed over and his voice suddenly filled the store, singing that silly Christmas song he released back in the early 90s and there I was, staring into a cheese display for three minutes. I saw Tom in many mediums, but going back to when I was still a teen, through all of the jobs I had, including many driving hours, when rock and roll radio was always on, I LOVED to hear his songs on the radio because they fit so perfectly. And now to realize that this voice, this guy, who has been singing and talking through this medium for more than forty years will only exist that way from now on — forty years of radio, concerts, MTV, and playing his music…forty years worth of LIFE blast through my head in the space of a few seconds. While it’s hard not to get sad and emotional, there comes the realization of not only the inevitability of life and death, but also, though I could’ve lived at any time, I lived in this time and heard all of this music and so much more… and my life was made so much richer by it. 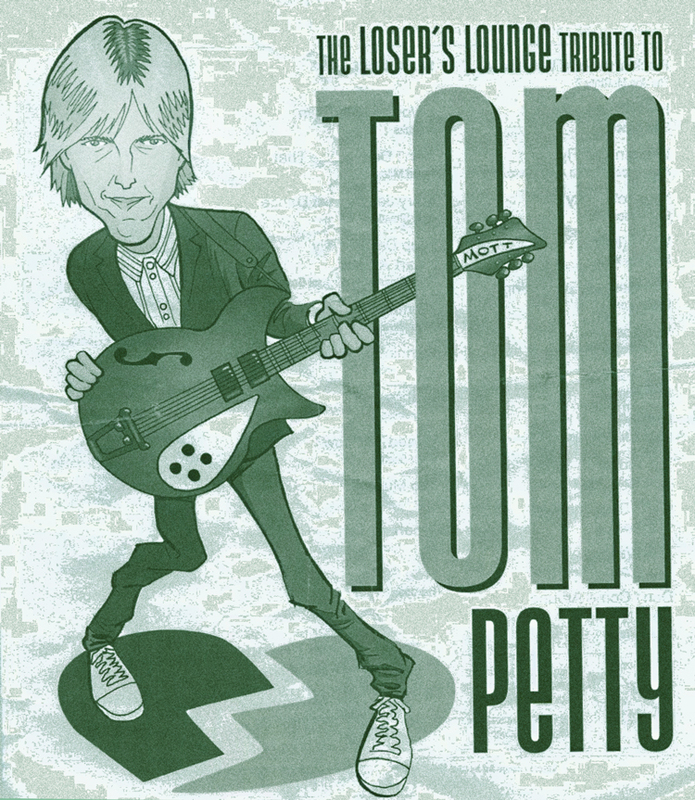 Recently I was able to attend the Loser’s Lounge Tribute to Tom Petty and it was pretty fun. This long-running music cabaret has thrilled and chilled audiences for a quarter century at this point. WOW! This is the first time I’ve seen them though and this isn’t something I would normally do, but I’m glad I went. The basic band is HOT! They are led by Joe McGinty and they are seriously crazy good…probably the BEST drummer I’ve seen in a long time only because he was so solid and crushing and you need that if you are going to put on a show like this. But everybody else: bass, guitars, percussion and backup/lead vocals by the core band was just brilliant. They had my attention all night. They had guest singers come up for the long two sets of songs they did and while some of it didn’t work, the stuff that did more than made up. The evening made me realize even more how great Tom Petty and the Hearbreakers were, because even the stupendous versions by these great musicians still came up short and so would anyone’s attempt to try to copy one of rock’s truest originals. Fare thee well Tom…Thank you! May you run down that dream forever! Barney Kessel is a guy I’ve mentioned a few times lately — in this post on learning resources and again as a member of The Wrecking Crew in this post on Glen Campbell. Above, he is playing an early 60s version of Gypsy in My Soul and of course he tears it up!. Barney was an early student of guitar and was already playing out by the time he was 14. Growing up in Oklahoma allowed him to meet another very famous Oklahoma native, Charlie Christian. While on break from touring with Benny Goodman, Christian went to see Barney play and the two subsequently ended up jamming for three days straight. This later led to Charlie recommending Barney to Benny Goodman and Barney getting the job after killing it on the jazz standard, Cherokee. The thing I really like about all of the guitar guys who came up in the 30s and 40s — Reinhardt, Christian, George Barnes, Herb Ellis, Harry Volpe, Les Paul, Sal Salvador, Johnny Smith, and Barney Kessel — is there is a whole lot of rock and roll in their playing. They were just completely going for it on many tracks because they all came up in The Swing Era when people wanted to dance all cray-cray like. You can hear that in Barney’s drive and some of the licks he plays in Gypsy in My Soul. But he also had a great sense of harmony and orchestration and those two sometimes very divergent qualities were combined in all of his performances. This is certainly one of the reasons The Beatles liked him. By the time Barney came along in the 1940s, Django Reinhardt, George Barnes and Charlie Christian were already on record playing all of the important guitar elements and ‘devices’: single lines, octaves, chords, partial chords, fast picking, sweep picking, bent notes, and tremolo picking that enabled the guitar to take on the role of a solo instrument in a band or orchestra setting. Reinhardt and Christian had already drastically expanded the language of the instrument with Christian veering from swing music into early bebop and Reinhardt adding classical and flamenco guitar elements to the jazz/popular canon. Barney Kessel combined all of these guitar devices, expanded on them and added a few of his own. As far as I know he is the first guy to popularize (and maybe even develop) the backwards pick sweep that shows up in his playing a lot. This enables completely different lines and a different sound, even though it was often played so fast that it sounded sloppy at times. He also played original bebop lines, cool 50s “out” phrasing and a lot of licks that expanded on Charlie Christian’s blues licks (which were different from Reinhardt’s) and sound like what would later be very poplar rock music motifs. Because Barney was also always playing an amplified electric Gibson 350, he was able to dial in a wide array of sounds including fat bass spankin’, sustained horn-type lines, lush harp-like chords and sweet almost vocal single string licks. The Antônio Carlos Jobim composition Wave (above) is a good example of how effective a chordal/single note combination is for setting a mood. Great texture and dynamics and just oh so s m o o o t h. There is a lot to be learned from taking apart what he does in this clip and I’ve picked up a few things by transcribing bits of this performance. It’s also more than just licks; notice the pacing, the mood, textures and sustained drive of the whole song. That is very important! Below, Barney once again takes a number at a wicked tempo with the always-enjoyable Herb Ellis, on the flat-out amazing Tangerine. Talk about smoking! The extra special enjoyment of this for me is that I’ve played both Wave and Tangerine in gig settings. They are two of my favorite standards and fun tunes to learn how to play. Barney had a very long career, playing with such greats as Chico Marx, Charlie Parker, Lester Young, Oscar Peterson, Ray Brown, Sonny Rollins and Julie London on the 1955 album Julie Is Her Name, which contains the million-selling song, Cry Me a River. As I related in my post on Glen Campbell, Kessel was a member of “The Clique” or The Wrecking Crew as they came to be known and was a “first call” guitarist for Columbia Pictures during the 1960s. FUN FACT: He played the bass for Spock’s Theme in the Amok Time episode of Star Trek. In the 1970s he performed with Herb Ellis and Charlie Byrd as The Great Guitars. Through it all Barney was most often spotted with just one guitar, a Gibson 350 with a Charlie Christian pickup. Although both Kay and Gibson tried to work the endorsement angle (and there are different versions of a Gibson Barney Kessel, a whole lot of his best work was done with that one guitar and he explains why in the following clip. I conducted an interview with Steve Howe, the guitarist in Yes, in October 2003 when I informed him that Kessel was critically ill. Howe has always cited Barney Kessel as a primary influence on his own guitar style: “Barney Kessel was the first American jazz guitarist I ever related to. I started playing when I was 12 in 1959 and I reckon about two years after that I was aware of Barney Kessel. I guess the Kessel album that was most important to me and still is, is ‘The Poll Winners’ with Shelly Manne and Ray Brown. ‘Volume 1’, a blue cover, on the Contemporary label. I bought it and most of Barney’s albums in London at Dobell’s, the famous jazz shop. It was archetypal, real jazz. I bought all the LP’s he made when he was the leader. I also liked him in support roles. I have the whole collection of ‘The Poll Winners’. One of the things I liked about Barney was his sound. Compared to other players, he had a very earthy, organic quality to his sound. And his playing was a remarkable mixture of ‘single line’ and ‘chords’, ya know, which inspired me to believe that any guitarist who doesn’t understand chords won’t be able to play much in the single line because they relate so much. Barney had his own great, highly individual approach to jazz guitar. The way he combined the chords and that single line. It was a perfect balance, really. “And there was something mysterious about his equipment. In England, we could recognize L5s or 400s but we weren’t sure if he was playing an L7C, or what. Nobody really knew what that guitar was for a while. We knew it was some sort of Gibson. They weren’t heavily clarified in catalogues nor readily available in England in the ’60s. That’s when the L7 was less than popular, ya know? But he had that characteristic big guitar. I mean, I obviously went on to play a rock ‘n’ roll 175. I got it in 1964 and bought a new one in 1975. That was styled after Kessel, who I had seen a few times on television, and Jim Hall and Wes Montgomery and other guitarists who also used a 175, the most gorgeous guitar. As I went around, people said, ‘Wow, you play that guitar?’ Because it wasn’t considered a rock guitar in any shape or form. So it was kind of a breakthrough and it did help me because the sound of a full body is so different from the solids, the slim lines that people were playing. And everybody asked me, ‘Why didn’t it feed back?’ Because I used a volume pedal and I stood a certain distance from my amp and didn’t use too much bass from my amp, I guess. I got ’round that problem but I certainly wasn’t directly emulating Barney Kessel but I was thinking I would not remove myself from that line of fire, because I wanted to be influenced by jazz. I’ve been saying for years what an influence Django Reinhardt was on the English rock musicians of the 60s and it’s interesting to learn about Barney’s influence as well. Definitely check out the whole article HERE at Spectropop for lots more on Barney’s life and career. He was at the crossroads of music through the 50s, 60s and 70s and performed with many of music’s biggest luminaries. The author interviews Barney’s sons and was able to speak with some of the music world’s biggest stars while Barney was in his final days. Brian Wilson: “Barney Kessel was a wonderful guitar player. He did a wonderful job on ‘Wouldn’t It Be Nice’. He’s in my prayers.” Barney is listed as playing mandolin on ‘Wouldn’t It Be Nice’ with other Wrecking Crew standouts Carol Kaye (bass), Hal Blaine (drums) and Larry Knechtel (organ). You can hear the backing track here. Here’s another interview with Barney from 1968 that’s notable for what he says about Jimi Hendrix and Bob Dylan. Do you think the people who have played guitar in more outlandish ways have aided the instrument? It’s like when Bob Dylan came out . . . I knew John Hammond, and that he had discovered Mary Lou Williams and, of course, he’d done a lot for Benny Goodman, Count Basie, Charlie Christian, Billie Holiday he’s really made the people aware of a lot of fine talent. He also brought Bob Dylan into public awareness and I tried to find out what was the redeeming factor there. He can’t sing, he can’t play guitar, he can’t play the harmonica; his melodies are very, very primitive, bordering on the Neanderthal. Well, trying to look at it objectively the redeeming elements, and the only ones, are the words to his songs, that had a message for the people of his age and his time. But since I’m not his age, his words have no meaning for me. They did not affect me in any way. Therefore, as far as I’m concerned, there were no redeeming qualities but I can see why he was accepted by a lot of people. It seems Barney was able to appreciate some of the styles from the 60s (even Jimi Hendrix) a little more later in life (thanks to his children), but it’s interesting what he says about each generation wanting it’s own heroes regardless of talent or abilities. How true that is! It is probably also true that most people, especially musicians who spend a lifetime fine-tuning their hearing and their brains to appreciate and play sophisticated music, will get turned off by music that doesn’t match that standard. He certainly liked bands like Brian Wilson, The Beach Boys and The Beatles…he covered Yesterday and that tune certainly has a great melody! You must be clear on what you want to do with music . . . not just clear—specific. It’s not good enough to say: “I want to be in music.” You have to be as positive as booking a certain seat on a certain plane for a certain destination. The minute you become clear on what you want, it becomes also very apparent what you don’t want. You begin to see the interesting studies, the things that could be intriguing to do, but which are not pertinent to your goal. Today, with all the perplexities, it is not what to practice, but what to avoid practising. What do you want to do? It is time—wasting to taste a little of all these things and not to be master of any—unless you are doing it strictly for amusement. But to accomplish anything, you have to know what you want. Finally, this version of The Shadow of Your Smile encapsulates everything that made Barney the musician he was: beautiful solo playing that never loses it’s drive, harmonic invention or melodic direction. There isn’t one wasted note, no wanking, nor one lick that is played simply to impress. It’s just a perfect musical performance. I love watching Barney clips on YouTube because they are always simultaneously entertaining AND a learning experience. In our imaginations and on our best days don’t we all aspire to to play like this? While Wes Montgomery and Joe Pass rightfully get a whole lot of praise for what they brought to the jazz guitar world, I feel not enough is said about Barney Kessel. He is beyond jazz — truly one of the titans of sophisticated guitar and a total music legend. Also, unlike Montgomery or Pass or many other players from that era, he was able to fit into a wide spectrum of musical situations and always bring his A- GAME. In addition to being an instrumentalist, producer and guy-on-the-scene, he became an educator later in his career. I’ve already linked to one of his instruction videos. Here’s another. Also, there are pages here and here that have some Barney-esque licks transcribed for your viewing, listening, and learning pleasure. During the past few weeks I have listened to three albums constantly: Revolver by The Beatles, Barbes by Stephane Wrembel, and Journey by Ali Akbar Khan. There is a common thread running through all three discs and that is Indian/Eastern music. I’m a fan of different types of music from the Middle and Far East though I really can’t say my knowledge of the subject is very extensive. There are many different instruments and types of music involved and I favor the more traditional/instrumental. I have heard a lot of Asian pop music and some of it is pretty good, but I find that the instrumentation and the arrangements better and more sophisticated in traditional/classical music. Like many people, I came to “know” (I use the term “know” very loosely and in it’s most superficial sense), Indian music through bands like The Beatles, The Rolling Stones and Led Zeppelin. Beatle George Harrison studied sitar with the late Indian virtuoso Ravi Shankar and became one of Indian music’s most vocal proponents. Norwegian Wood, which was written by John Lennon, was the first Beatle song to use the sitar and was basically a western song that employed the sitar for musical effect (the same can be said for The Rolling Stones’ Paint It Black). There is some great background at The Beatles Bible (A great site!) on the London scene at the time of recording Rubber Soul and Norwegian Wood. (As I have written on the blog before) Jeff Beck and The Yardbirds were also early pioneers of Eastern-inspired pop music. The original take of Heart Full of Soul actually had a sitar on it! The Davies brothers from The Kinks were also recording music with Eastern sensibilities (See My Friends) at the time. In the States, The Byrds 1965 hit Eight Miles High had a sitar-flavored Rickenbacker guitar sound playing John Coltrane-esque lines, which was pretty far out and groovy for pop music. As the 60s progressed “that Eastern sound” would become synonymous with being stoned and/or altered states of consciousness, much to the displeasure of Indian musicians like Ravi Shankar. Unfortunately, the sound and influence of the music became so popular that it would invade even the most trivial and superficial places by the end of the decade. When the Beatles’ follow-up album to Rubber Soul, Revolver, was released, it contained the Harrison composition Love You To, which was the first attempt to go “further into the style”. This tune would be a template for later Harrison songs like Within You, Without You and The Inner Light: they are all attempts to play bona-fide Indian music, albeit in a western pop music format. Musically though, I think Love You To is one of George’s best songs ever. Great arrangement and performance and he stays within the confines of the pop style. Other songs from Revolver that are very Eastern, but don’t contain any Eastern instruments, are the fantastic John Lennon compositions Tomorrow Never Knows and She Said, She Said. The former, a drone chant from The Tibetan Book of the Dead on a cool, repetitive Ringo beat with loads of sounds and tape effects, broke a whole lot of rules for pop music and the guitar lines from the latter echo the Eastern-influenced mixolydian lines and quarter to half step bent-notes that one could also hear from Jeff Beck (Shapes of Things, Heart Full of Soul) and Jimi Hendrix (Love or Confusion, Purple Haze) during this time. As the 60s transitioned into the 70s, these Indo/Eastern influences became less of a thing in pop music, but started appearing in the jazz, fusion and progressive rock music of bands like Mahavishnu Orchestra, The Moody Blues, Led Zeppelin, Shatki and many more. In 2006, Stephane Wrembel, Manouche guitarist extraordinaire, who is also a huge fan of prog-rock and student of Indian music, released his disc, Barbes. Recorded when his group was a trio (with bandmates Jared Engle on bass and David Langlois on percussion) the disc is the perfect modern synthesis of three major styles of music: jazz, prog-rock and Indo/Eastern music. I have always dug this disc! Brilliant playing and my favorite of everything he has done. (To see his band live during this time was also a great experience as the clip above proves). Not only are the originals on Barbes fresh and inspiring, the band also covers Django Reinhardt‘s Fleche D’Or, Dizzy Gillespie‘s Night in Tunisia and John Coltrane‘s Afro Blue. The group takes some of these tunes at breakneck tempos and the performances are a dizzying array of chops and melodic invention. Also, the ambient “mood” tunes, including (Introductions, Detroductions) are music of sparse instrumentation and indeterminate origin; world music ragas perhaps? A Raga is: in the classical music of India, Bangladesh, and Pakistan, a melodic framework for improvisation and composition. A raga is based on a scale with a given set of notes, a typical order in which they appear in melodies, and characteristic musical motifs. Manouche music or Gypsy Jazz has strong Indian roots because it is generally agreed that the group of people known as “Gypsies” originated on the Indian subcontinent and first migrated into Europe in the 12th century. There are various sub-categories of these Romani people: Manouche in France, and the Sinti of Central Europe. Sinti/Manouche guitar playing sounds very similar to not only Indian classical music, but some of the progressive rock and jazz of the 1970s. One huge connection is that IMPROVISATION is everything in Indian music, likewise for Manouche music or a lot of 70s rock/jazz as well. A Manouche player must have a very disciplined mind and an aural technique that includes whole tone scales, diminished and augmented arpeggios, altered scales and arpeggios and an emphasis on the “Django-favored” sixths and ninths of the harmony chords. Modern players like Stephane Wrembel have added depth to the sonic palette of the music by combining it with other influences and adding their own touches of musical imagination. There are rhythmic devices and picking patterns found in Indian music that one does not normally hear in a lot of western jazz or classical music and Stephane explores the picking and rhythmic subdivision topics in his book, Getting Into Gypsy Jazz Guitar, which I review here. He advises picking quarter notes up through nontuplets (subdividing by 9 to the beat) with the metronome as warm-up exercises. He explains that, “musicians in India have their own efficient approach to time consisting of singing rhythms using certain syllables. A similar approach may be applied to right-hand technique which will allow for warm-up…” This is a very good way to improve your picking technique and I can say I did it religiously for about six months. In addition to giving my a bunch of listening pleasure, Getting Into… and Barbes are windows into another world and their influence definitely helped make me a better guitar player. Here are some further insights into the nature of Indian rhythm, courtesy of Ravi Shankar. Ali Akbar Khan “was a Hindustani classical musician of the Maihar gharana, known for his virtuosity in playing the sarod.” Born in modern-day Bangladesh, he was trained on a variety of instruments under the guidance of very strict family members who had him practicing up to 18 hours a day. His sister, Annapurna Devi, was also an accomplished musician and was, for a time, the wife of fellow student, Ravi Shankar. Over the years Ali Akbar Khan and Ravi Shankar would perform many times together, including at The Concert for Bangladesh in 1971 and were easily two of the most prominent Indian musicians in the western world. After moving to the USA in the late 50s Khan would found a couple of schools, one in California and one in Switzerland and would spend the next 40 years touring and performing until his health failed in the late 2000s. I’ve been listening to Journey for the past 10 years and find it very enjoyable. As I related earlier, I’ve always liked the sound of Indian music, especially if it’s instrumental. Eastern philosophy doesn’t necessarily compartmentalize like Western thinking and Eastern music doesn’t separate Eastern Mystical concepts (that were the lyrics of western songs like The Inner Light or Within You, Without You) from the music. Some of the best musical numbers on Journey include Morning Meditation, Temple Music and Lullaby. I don’t meditate (perhaps I should? ), but the sounds of this music conjure up great feelings of emotion and ambiance that I hear in any other great, sophisticated music. The happy, get up and go riff of the title cut, Journey, is brilliant and fun as is the dark and somewhat stormy Carnival of Mother Kali. The romantic, almost child-like melody of Come Back My Love sounds like mid-60s George Harrison song and the other ballad-type tracks have the pacing and deliberate delivery that one can hear on some of the tracks of Barbes. There is a whole lot of crossover between these three discs is what I’m trying to say! Khan’s Sarod has a stoic depth and darkness even in happy moods, and his soulful playing is augmented by Guitars(! ), Tabla, Shakers, Tanpura, Keyboards, Duggi and Dholak. All of the music was composed by Ali Akbar Khan and was recorded in 1990, giving the disc a classic, but very modern sound. Alvin Lee was an awesome blues-rock guitarist who had a big impact on the rock music world after his appearance at Woodstock in 1969. His band was Ten Years After (because it began 10 years after Elvis Presley’s golden year of 1956) the name of the song that killed people at the Woodstock Festival was I’m Going Home. Check it out below. When I was a kid my dad used to crank this song. He wasn’t a ROCK guy by any stretch of the imagination, but he loved this tune. He taught high school history and law classes and because his students at the time were talking about bands like Santana, Crosby, Stills, Nash and Young and Ten Years After, he checked them out to see what the buzz was about. I couldn’t ever convince him that the Jimi Hendrix version of the Star Spangled Banner was brilliant, but I tried…boy did I try. Ten Years After had a string of hits in the late 60s and early 70s, all of them driven by Lee’s explosive guitar attack. He was rooted in the blues and early rock and roll, but he and his band made it explosive. I used to love listening to their renditions of Good Morning Little Schoolgirl, Turned-Off TV Blues, One of These Days, Baby Won’t You Let Me Rock ‘n’ Roll You, I’d Love to Change the World and The Hobbit. Over 10 years before This Is Spinal Tap Ten Years After released an album called Stonedhenge. I think Alvin and his band were the link between old-time rock and roll and those heavier bands that emerged in the late 70s and early 80s (AC/DC, Motorhead, UFO) because there was a blues and rock and roll feel to it but it was so metallic and energetic. Shortly after the hit single I’d Love to Change the World, Lee left Ten Years After to pursue other guitar projects. A very acclaimed album On the Road To Freedom resulted from a partnership with Mylon LeFevre. The record was partially recorded at Lee’s studio with guest appearances from Ron Wood, George Harrison, Jim Capaldi, Stevie Winwood and Mick Fleetwood. In addition to guitars and harmonica, Alvin played a sitar on this record. I haven’t heard this record for a long time but I remember it being very, very good and very unlike Ten Years After and the pyrotechnic style Alvin was known for. He was a much more versatile guitarist than many people ever knew. He would form other bands, reunite with Ten Years After and embark on projects with other guitar luminaries like Mick Taylor, Scotty Moore, Peter Frampton, Albert Lee and Rory Gallagher. He played a Gibson 335 for much of his career and still had the original Woodstock 335 at the time of his death. Watch below…looks to me that Alvin plays a lotta downstrokes and swept strokes. Maybe he was into Django Reinhardt or part gypsy! While he never achieved the same plateau of success as the early days, Alvin enjoyed a lifetime of playing bitchin’ and beautiful guitar. I’m Going Home sounds as cool today as it did all of those many years. As my dad would say and do — TURN IT UP! Hey there! 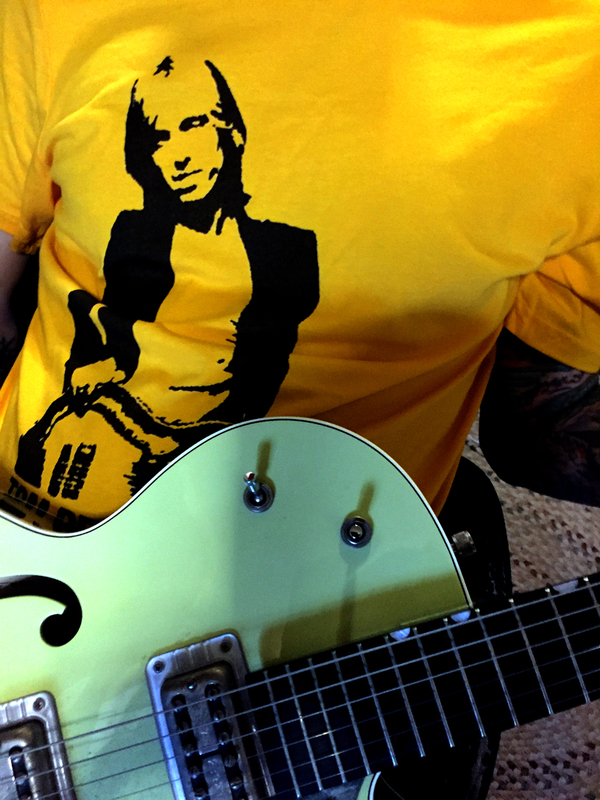 Welcome to The Guitar Cave, a blog dedicated to music, art, design, writing, life and, of course, the guitar. I've been playing the guitar for a long time and I have been blogging here at Wordpress since 2011. Hopefully you will find some of this stuff interesting and/or entertaining. I try to keep it light and love to share the things I learn. Have a look around and don't hesitate to get in touch if there is something on your mind. "Yean...I don’t know sh** from shinola. Maybe that’s why I’m so original!" The Death of the Electric Guitar! Update: The Guitar is Totally Not Dying!